It was not a routine affair that Arsenal fans around the globe expected as they were forced to work really hard to secure a victory against a resolute Stoke City. Stoke were adventurous in the first-half and did not show any inhibitions going forward. Arsenal were lacklustre to say the least until the hour mark after which they increased the tempo. Both teams had their chances in the second half and Xherdan Shaqiri even hit the upright directly from a corner kick. But it was Arsenal who drew first-blood. Mesut Ozil was tackled form behind inside the box by Bruno Martins Indi and the referee awarded Arsenal a penalty. Pierre-Emerick Aubameyang stepped up and sent Jordan Pickford the wrong way to give Arsenal the lead in the 75th minute. Aubameyang doubled the lead in the 86th minute as he smashed an effort into the net following a corner from inside the box. Alexandre Lacazette made it 3-0 to the home side as he won a penalty and stepped up to score it. A bit harsh on Stoke, who played extremely well but have little to show for it. Worst half of football in Arsenal history? Arsenal's club record signing and star striker now playing left wing. All four Arsenal fans have booed the team down the tunnel. Pathetic showing by Arsenal fans ,absolute joke , try going through what City fans did with gross mismanagement for 2 decades. Fickle Tarquins. That was until Aubameyang happened! Since Alvaro Morata last scored a league goal for Chelsea, Aubameyang went on strike for Dortmund, joined Arsenal and scored 5 goals! Love that from Aubameyang 👏🏼 on for a hat trick but let your strike partner take the penalty so he can score. Very unselfish. At least we have Aubameyang. One tiny slither of hope & excitement amid a sea of putrid mediocrity. It's for reasons like that Aubameyang earlier miss that I think assists are the most underrated stats in football. You could serve a ball on a plate with knives and forks but your stat is completely dependent on the attacker not "Welbecking" the chance. 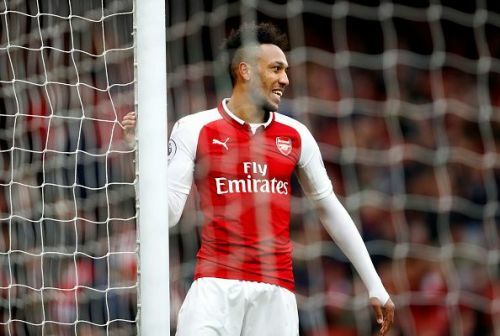 Despite off the field problems at Dortmund and having to adjust to an Arsenal side in their worst form in recent years, Aubameyang has scored 26 goals and provided 4 assists in 31 starts this season. We’ve got one hell of a player on our hands.